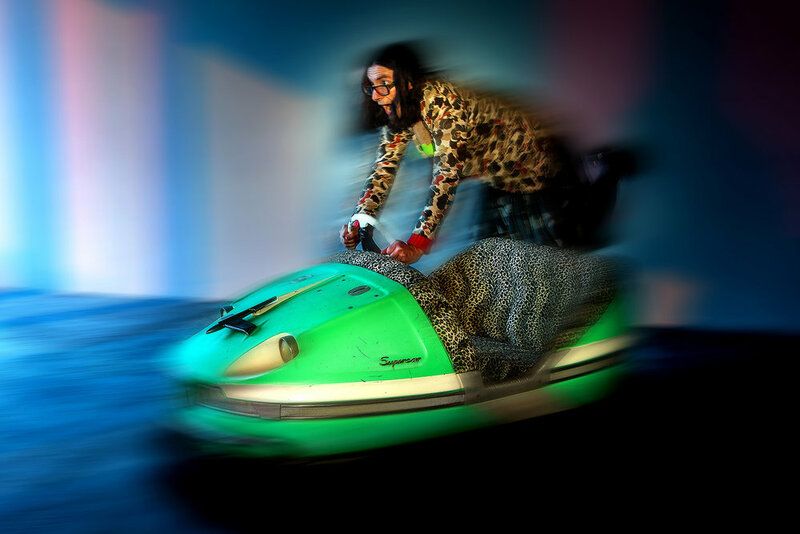 Commissioned in 2017, a collective of visual, sound and light artists, directed by Marcus Lyall, collaboratively created the world’s first artist-designed bumper car arena - a spectacle elevating bumper cars into performance art. 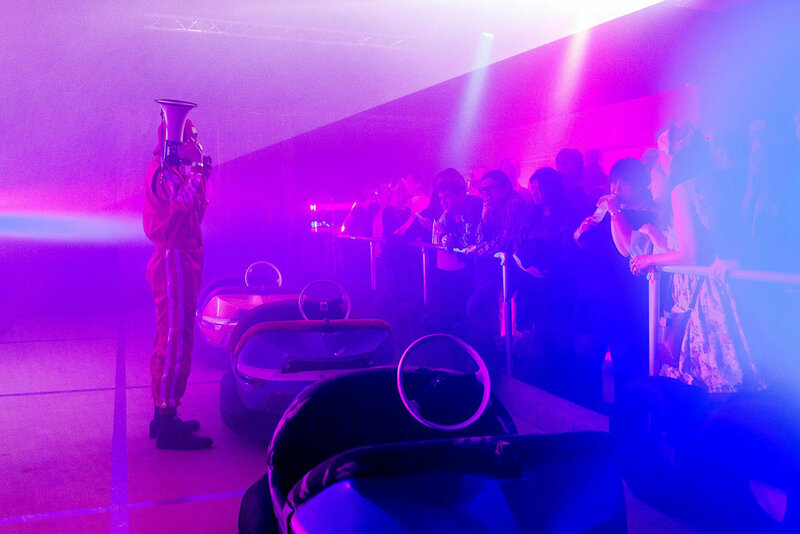 Visitors were invited to drive a 1960s converted Supercar fitted with sensors, sound systems and lights. After your mood was categorised on the Plutchik wheel of emotions, visitors were matched to a car. Each car had a different personality and through sensors was designed to interact with its driver. With all cars full, you were unleashed on the strange and lurid landscape of tunnels, projections and light and soundscapes. 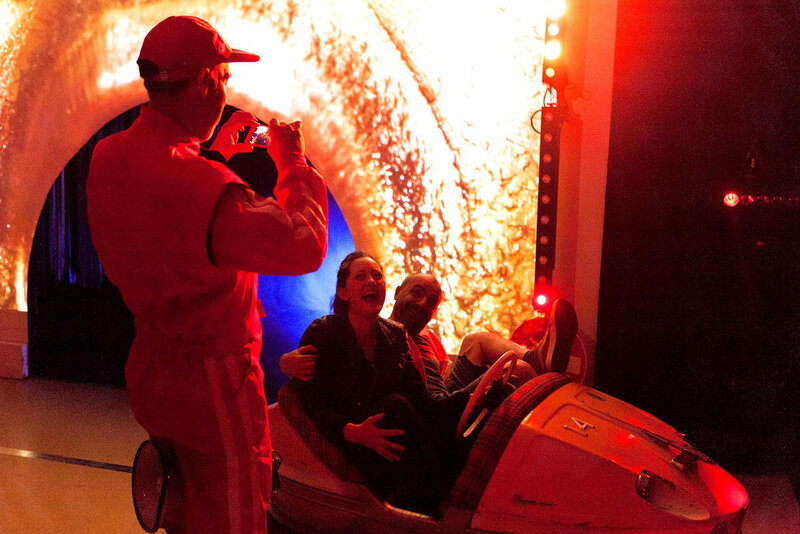 Drive Dead Slow took the location of a disused fire station - traditionally a place of order and safety - and juxtaposed it with the chaos and random collisions of a fleet of dodgems. 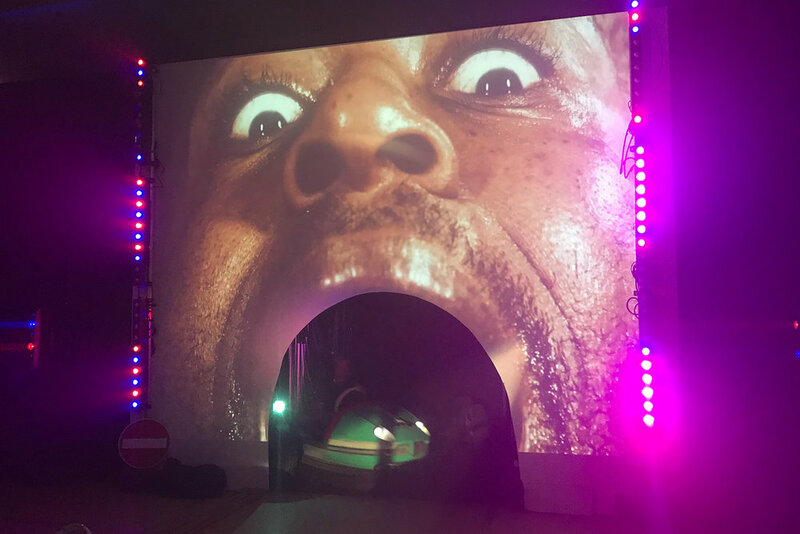 Directed by Marcus, the British artist behind award-winning stage visuals for the Chemical Brothers and Metallica, Drive Dead Slow celebrated the centenary of ‘The Whirl of The World’, a ride first experienced in London where the motion was created by an arrangement of tilting floor panels. This evolved into the dodgems we know today. The Supercars used were cousin to the very first British-made dodgem car launched in 1934, re-positioning the iconic fairground ride. Drawing upon the colours that characterised the wheel of emotions, Bompas & Parr created the Plutchik Café serving artisan crisps, sandwiches and the world's first colour changing polarising kaleidoscopic gin and tonic, and colas. Location A disused Fire Station before its re-development on Southwark Bridge Road, Bankside, SE1 0EG. In 1878 the building became the first London Fire Brigade Headquarters. Kindly Supported by DPL Production Lighting, the London Fire Brigade and Hire Intelligence. Key coverage total reach 306 million. Media included: The Evening Standard, The Guardian, Time Out, Metro, Visit London, London Calling, Refinery 29: Monocle Podcast, Lambeth Life and The Londonist. Marcus has created experimental film and interactive projects for the last 20 years. Starting with live film shows during the heady days of rave, he moved on to specialise in making visuals for large-scale concerts. He now works on a range of moving-image projects from award-winning stage visuals for The Chemical Brothers to Metallica's feature film, and directing a commercial starring Lionel Messi. He has created a number of artworks exhibited at galleries including: The ICA, National Gallery of Australia, Seoul Museum of Modern Art and The Science Museum, London. As well as managing the world’s first radio art station, ResonanceFM, Ed is an Associate Lecturer at London College of Communication. He also formed the Resonance Radio Orchestra with Chris Weaver in 2004 as a floating pool for radiophonic experimentation, the various incarnations of which have included i.a. 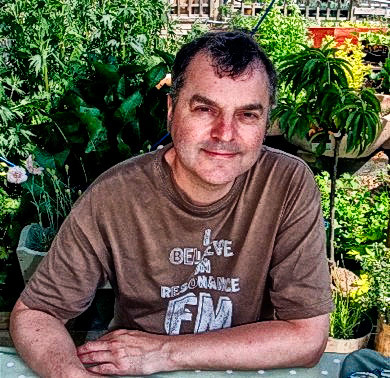 Ed has been recognised as BASCA Composer of the Year by Sonic Arts 2013; nominated Station Programmer of the Year, Sony Radio Academy Awards 2010; featured in The Independent on Sunday’s Happy List 2009; and, runner-up - PRSF New Music Award, 2008. Bompas & Parr are industry leaders in flavour-based experience design, culinary research, architectural installations and contemporary food design. Bompas & Parr have written six books, among them the studio republish Memoirs of a Stomach, a lost-and-forgotten 18th century tome brought up to date with visuals from inside the digestive tract of food writer, pop-up chef and Sunday Times columnist Gizzi Erskine. Working with some of the world’s foremost cultural institutions, Bompas & Parr have exhibited at Barbican Art Gallery, Garage Centre for Contemporary Culture, Salon del Mobile, San Francisco Museum of Modern Art, Serpentine Gallery, Victoria & Albert Museum and the Wellcome Trust. Over the past 30 years James Cauty has distinguished himself as a musician, artist and cultural provocateur through fusions of high art and popularist mediums. From a string of number one hits as founder and member of band, The KLF to implementation of the The K-Foundation and the seminal action, Watch the K-Foundation Burn a Million Quid (1994), to later artistic experiments with sonic weapons, stamp collecting and model making, cultural subversion and a gleeful level of high humour are elemental to all the work whilst never failing engage its audience in critical pleasure. Punk is not just an aesthetic to artist Luke Morgan: his recent paintings explore found materials’ words and their meanings. He writes and performs with his band The Highliners and curated the Let it Rock venue at the award-winning Goodwood Festival. In 2010, Luke co-founded Supergroup London, a loose collective that allows them to call on a group of very experienced specialists as and when projects require it. To coincide with the Olympic Games, Supergroup was commissioned to create the Movement Café in Greenwich working with writer Lemn Sissay, one of the official Olympic poets. The artists have an international reputation completing permanent and temporary commissions for spaces including; Zynga, San Francisco, London College of Communication, Birmingham Museum and Art Gallery and the Southbank Centre, London. Tony started Einstein's Octopus in 1987, specialising in art direction and construction for the film industry. In the 30 years of operation, Tony’s company has become the go-to for design and construction for commercials, fashion, exhibition, films, stills, TV, museums, pop promos, theatre and events. If it can be created in three-dimensions, Tony is able to make it. Dave Cranmer has been creating electronic and mechanical sculptures since 1998. These have been used to delight and confuse audiences in a variety of venues worldwide. 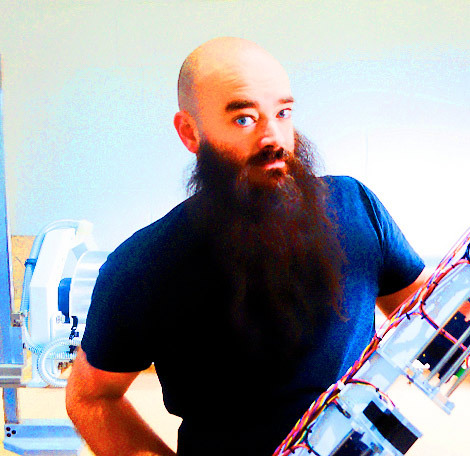 Time spent in the special effects industry has fine-tuned his love of dangerous machinery and dramatic engineering and a keen interest in experimental audio has led to many sculptures taking the form of unusual musical instruments. Dave Cranmer has produced installations for many events including Southbank Ether Festival, Kinetica Art Fair and HKW Worldtronics Berlin.